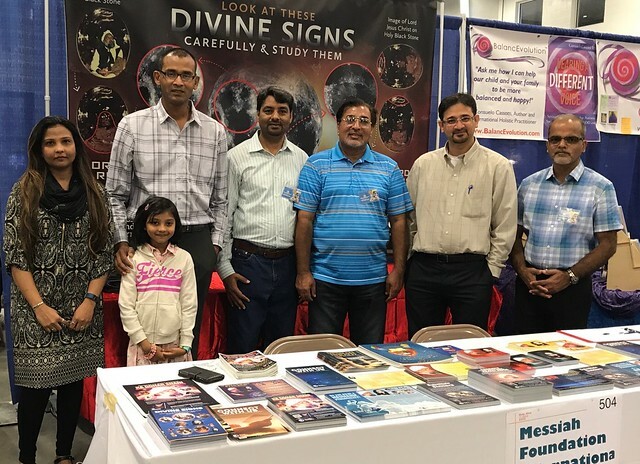 A team from Messiah Foundation USA set up their booth at the Body Mind and Spirit Expo in Columbus, Ohio on the 16th and 17th of September. The expo had around 3000 attendees who took great interest in learning about the divine images of His Divine Eminence Gohar Shahi on various celestial spheres. They were keen on obtaining free spiritual healing and the Opening of the Spiritual Heart. Our stall was extremely busy and attracted people from all walks of life. A large banner depicting the images of HDE Gohar Shahi and Lord Jesus on the Moon, Sun and Holy Black Stone were also showcased at our booth. The method of the Opening of the Spiritual Heart and the revolutionary teachings of HDE Gohar Shahi were given to all who stopped by our booth. Delegates of Messiah Foundation also introduced The True Mehdi and The Messiah Herald magazines to recipients. A large number of people took HDE Gohar Shahi’s book The Religion of God (Divine Love) for investigation purposes and personal interest. Overall, our team had a great time and was overwhelmed by the positive response from both the public and their fellow exhibitors.